Seems like a very underrated candidate for worst trades in franchise history. I don't know about that. 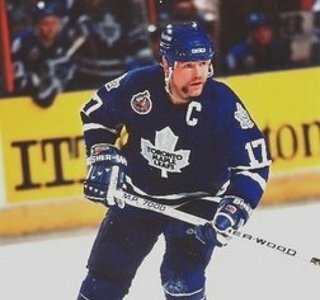 That trade brought Fuhr to the Leafs, which ultimately became Andreychuk and Jonsson (who is a candidate for one of the worst trades in franchise history). Without this trade, the great runs of 93 and 94 don't play out the same way. I mean the trade itself was a 22-year old PPG centre for two older, declining players who didn't really do anything as Leafs. And during a time when the Leafs needed youth a heck of a lot more than veterans. I'm not really that big into expanding trade trees to judge a single transaction, especially since it's not like 93 and 94 actually got us the Cup. And who knows what the team could have done with Sundin (assuming he was still acquired), Gilmour, and Damphousse for a few years. Sure, in isolation, it's not a great trade. It's still a long way from the worst in franchise history conversation, though, and it directly lead to a significant piece of the best Leafs team the city had seen since the late 70s. But couldn't a 22yo PPG player also be a significant piece in those runs? Either way I just don't understand why we basically gave away a Nylander equivalent for old declining players. I think Damphousse seems like an underrated player. I think Damphousse seems like an underrated player. I think he was somewhat under appreciated here if memory serves. He was a very good player. Not elite, but very good. Mitch Marner: 1st player in #Leafs history to begin career with 3 straight 60-point seasons. Hahaha, Matthews will be the second lol..Only reason he wasn't the first was because of injuries. Isn't it awesome to have these 2 KIDS on our team!!! I guess the argument is not all those teams have cap issues like the Leafs do where they might not necessarily match. But Tampa certainly does, and Winnipeg to a degree too. It's a lousy argument because it still misses the central problem with offer sheets. Either an offer sheet is prohibitively expensive in which case the player's not worth the offer or it isn't in which case the team that can match it will. The idea that any team's cap issues would necessitate them passing on a reasonable deal for one of their elite young players is basically making the argument that the Leafs would rather keep Kadri or Zaitsev over Marner. Interesting hypothetical that I saw floated around: let's say Marner signs an offer sheet for $11-12mil on July 1st. The Leafs would then have one week to decide to match it or take the compensation of four 1st round draft picks. During that week, they speak to one of the big-3 free agents (Karlsson, Panarin, and Stone) and agree in principal to a contract. Let's say $11mil for Karlsson, $10mil for Panarin, and $9mil for Stone. Or whatever. Basically the question is would you take the four 1st round draft picks as compensation for Marner and use that cap space to sign one of those 3 free agents instead of matching the offer sheet and keeping Marner? Goodbye Marner, hello Panarin + 4 1st rounders. In truth, it's a hard decision to make, but you could do a lot with those picks. I wouldn't do it. I don't like any of those UFAs enough(except Karlsson but I'm not thrilled with paying him that much past 34 or 35). To some extent though it would depend on the team that made the offer sheet. But even then I think the Kessel rule should apply here in terms of future draft picks where you have to evaluate the trade in terms of the worst possible outcome re: the picks. Having 4 bonus 25-32 slot picks just doesn't seem that exciting. I think you have to consider it. I'm less sold on Stone - he's having a great season, but I think he's more of a 60ish point guy that the point-a-game guy he's been this year; whereas Panarin and Karlsson are at a similar talent level as Marner. Even still, with those 4 extra 1st round picks . . . Page created in 1.346 seconds with 26 queries.